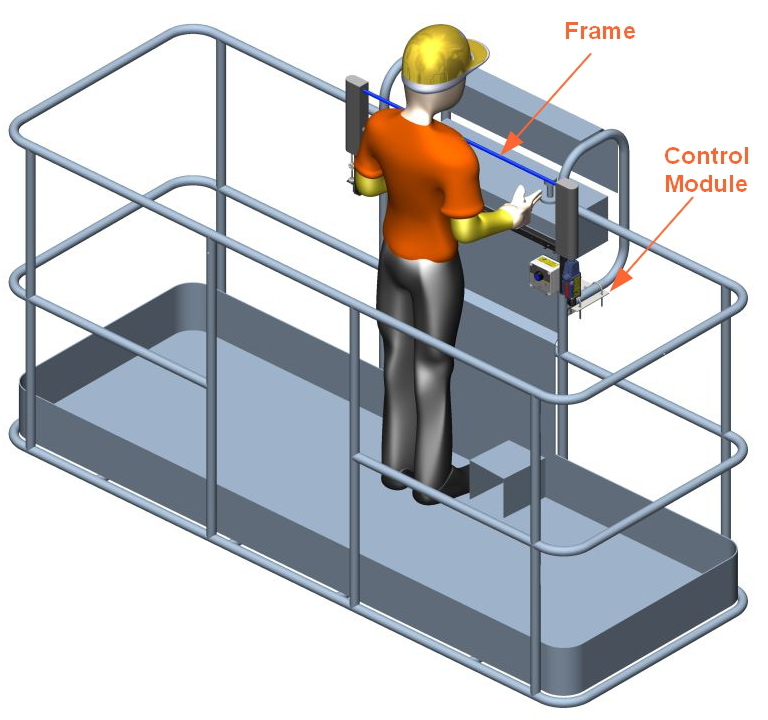 The Crush Guard® is composed of two major components: Frame and Control Module. The picture below shows the Crush Guard components installed on a Genie EWP. The cable trigger is a length of cable enclosed within a rubber hose positioned in front of the operators chest. When the operator is pushed onto the cable the alarm will trigger to stop all hydraulic functions. The two vertical posts used to position the cable at the operators chest height. Each post contains a spring return hinge. If the operator is leaning to the side and is forced onto the post, the post will bend preventing the operator from being crushed and trigger the alarm. One end of the cable trigger is attached to the frame using a magnetic anchor. If the operator is forced onto the wire even after the hydraulic functions have been cut off, the magnetic anchor will release making the wire go slack. This will prevent injuries from getting pinned by the wire. The other end of the cable trigger is attached to the force sensor. When the amount of force on the cable trigger changes the sensor will activate and trigger the alarm. 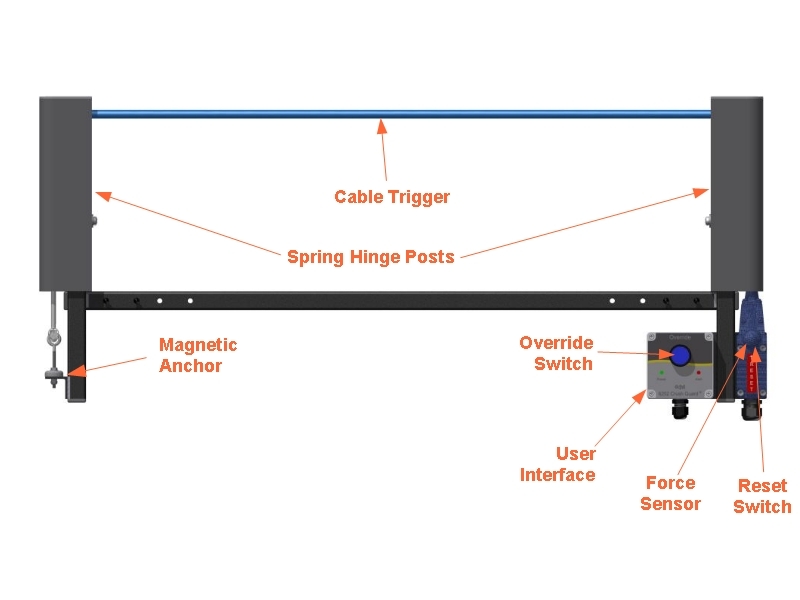 The force sensor will trigger on either a positive force increase, such as force applied to the cable trigger, and also a negative force decrease, such as if the magnetic anchor is released. The reset switch is positioned on the rope switch and is used to return to normal operation after the alarm has been triggered. The user interface contains the operational status lights and the override switch. The override switch is used to temporarily override the alarm to restore hydraulic boom movements to allow the operator to move the EWP away from the crushing hazard. The control module performs the processing requirements for the Crush Guard® system. The Crush Guard® uses two independent processors to determine when the alarm needs to be triggered, meeting the requirements of performance level D according to the ISO13849 standard. 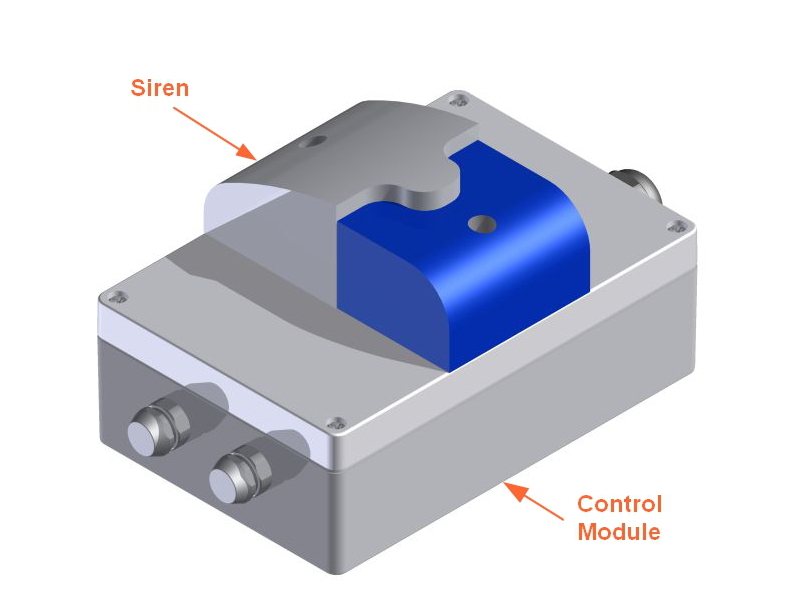 The siren is mounted to the control module and consists of a loud 120db buzzer and a blue flashing strobe light. The buzzer produces an alternating alarm tone so it can be heard over the background work site noise by the personal on the ground.